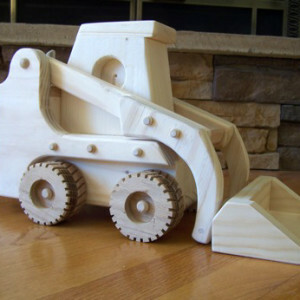 This wooden bobcat measures 10 inches tall by 7 1/2 inches wide by 16 inches long when the bucket is down. It is constructed of pine with oak wheels. The bucket moves up and down fro picking up a load and dumping it. 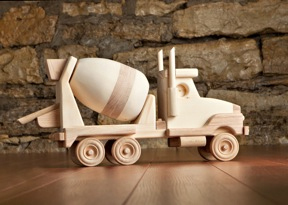 This handmade cement truck can handle the biggest jobs. It is constructed of pine and oak with birch wheels. it is made using dowels and a water based FDA approved wood glue and clamped. No nails or screws used to construct. Time to haul away the dirt. 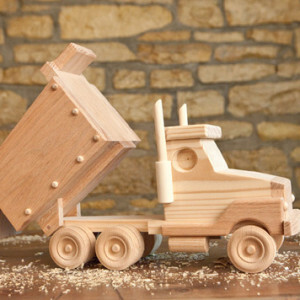 This handmade dump truck can handle the job. It measures 16 inches long by 6 inches tall. It is constructed of pine and oak and maple with birch wheels. it is made using dowels and a water based FDA approved water based wood glue and clamped. No nails or screws used in construction. Back of the truck raises and lowers for dumping that load of dirt. 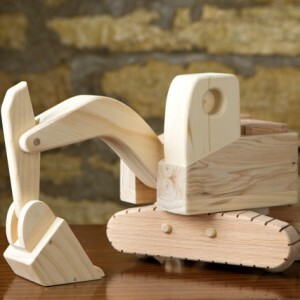 This wooden excavator measures 7 inches wide by 10 inches long at the tracks. It is 16 inches tall when the bucket arm is in the up position. The toy swivels 360 degrees and the bucket moves up and down for digging and dumping dirt. It is constructed of pine and oak with birch wheels.